The Inn at Pelican Bay announces competitive international hotel rates for travelers from Europe and South America. These international travel deals include a free night when guests stay four nights. We’re excited for guests to experience Naples with a vacation at the INN at Pelican Bay, and guests love that they can save money in the process. The INN at Pelican Bay recently introduced exclusive international travel deals, offering European and South American travelers a free fifth night when they book a four-night stay. For a limited time, the INN at Pelican Bay is offering this exclusive promotion for travel between May 28, 2014 and October 2, 2014. The upscale, boutique hotel is a mile from the Gulf of Mexico’s white-sand beaches and crystal-clear ocean, making it a prime destination for international tourists. The international hotel rates will encourage guests to extend their stay in Naples to more fully experience all the area has to offer, including a wide variety of shopping, dining and entertainment options. After recently completing a multimillion-dollar full property renovation, the Inn at Pelican Bay offers guests from around the globe a taste of tropical luxury for the getaway of a lifetime. Poolside entertainment on Saturdays from 1 to 5 p.m. Whether guests are from Argentina, France, Brazil, Colombia, Germany or the U.K., they’ll be pampered with upscale amenities and gorgeous weather on Florida’s Paradise Coast. The INN at Pelican Bay places guests within walking distance of popular restaurants and pubs, making it an ideal getaway for couples and families to enjoy. The INN at Pelican Bay is also located near world-renowned shopping locations. International travelers can find competitive shopping deals in South Florida at the nearby Miromar Outlet Mall, Waterside Shops and the Mercato. 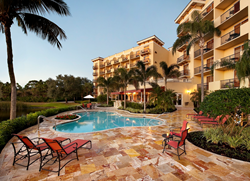 Just a mile inland of the Gulf of Mexico, the Inn at Pelican Bay is an upscale, boutique hotel in Naples, Fla. It features refined amenities, superior service, luxurious guest rooms and close proximity to an assortment of renowned shopping, dining and entertainment options. Additionally, the hotel specializes in hosting elegant weddings and events. More information is available at http://www.innatpelicanbay.com/.